To access available smart content on your Home Theater Display, you can download this free app to a compatible smartphone or tablet, turning it into a powerful touch-screen remote. Stream from apps such as Netflix and YouTube, or browse over 200,000 TV shows and movies, 30 million songs, plus radio, sports, games, and more. Discover a range of free, subscription or paid content from multiple apps. 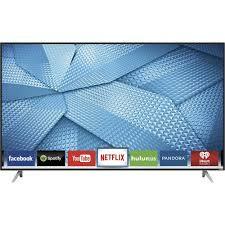 This VIZIO E-Series is the perfect smart-home companion, offering voice-control support from Google Assistant and Amazon Alexa-enabled devices. Lets you easily connect your digital camera, camcorder or other USB devices.